In the last three posts I’ve given an overview of three important pillars of successful self-care when part of your daily life revolves around caring for a loved one. Put these in place and you can begin to reclaim more of your life for yourself than you thought possible. Yet even with clear desired outcomes, an improved ability to carve out some “down time” to rest, and greater skill at saying “No” when you need to, there is one more hidden tripwire that can thwart you. You may have the best intentions, but habits driven by beliefs reinforced over a lifetime can sabotage you before you are even aware you have a choice in the situation. What causes them to take over? The discomfort of making change, instead of doing what you’ve always done. Today’s excerpts from the fourth chapter of the Take Back Your Life book explains it best…. While you may feel isolated and disconnected in your dilemmas and challenges, you are not alone. More than forty-three million people just within the United States are providing care for a family member. That’s potential for a huge support system, and support does exist, even if you are not yet aware of all the forms it can take. Whether you go it alone or have a support system, you are going to have some uncomfortable feelings as you make these changes. There’s just no way around it. You will probably experience some stress and tension, because you are challenging deeply ingrained, old, and familiar attitudes that you’ve held about yourself, including attitudes and beliefs that your parents and family members held about you. These created habits for you, such as those that keep you doing the same things and hoping that this time it will work out better. 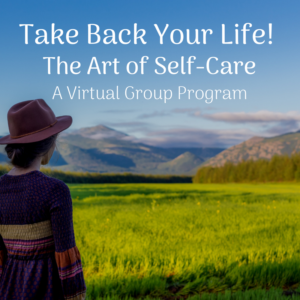 Having support, guidance, and encouragement to implement these new self-care attitudes and behaviors makes a huge difference, and high-impact groups are particularly successful at helping you to do that. It’s time to ask yourself: Do I deserve to feel happy, fulfilled, content, and at ease with myself – right now? If the answer is “yes!” then know that you don’t have to wait for someone to get healthy, pass on or move away in order to feel good about your life. Your willingness to feel good, whole and empowered within yourself does not have to be contingent on someone else’s behavior, attitude, or beliefs. If you read between the lines a little bit in the above sections you’ll notice that one of the requirements for receiving support is asking for it! At the very least you need to be talking to people in your life about what you’re going through, even if it’s uncomfortable, and even if you don’t think they will be able to do something specific to help. Please note that this is not the same thing as constant complaining! When you are learning about self-care, and about your particular strengths, weaknesses, patterns, thoughts and beliefs, sharing what you’re going through and how you’re trying to cope with it doesn’t amount to complaining – it’s just letting people know what’s going on with you. That gives them a chance to offer not just love, support, encouragement and empathy, but potentially useful ideas for additional resources. They may even have suggestions for fun activities and amusements to lighten up your daily grind, or organizations offering advice and even assistance in that particular area. You never know! But what’s certain is that if you stay silent and isolated, no one will have a chance to contribute anything helpful to you – whether that’s just a shoulder in the moment, or a great solution to a problem that’s been stressing you out for a long time. So, be a hero for yourself by staying connected and staying in communication – even when you just want to pull the covers over your head and feel miserable by yourself! No matter what happens in a particular conversation, the habit of being in communication will serve you well in both the short and long run. It provides ongoing access to emotional and spiritual replenishment, and helps keep you from further sabotaging your own happiness by staying hidden in your “comfort zone” of isolation. Did this article resonate with you? What did it bring up in your own life that made you think? Leave a comment below or send me an email at Loren@LorenGelbergGoff.comto let me know what you can see now that you didn’t before, and what changes you intend to make in your life as a result of that new insight. 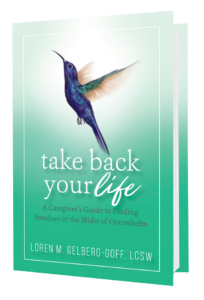 For more ideas on being an empowered hero for yourself – so you can also be the best caregiver you want to be! – be sure to get the book and keep reading!